Make your employees happier, increase their performance and reduce IT support costs by upgrading to a Latitude 5470. 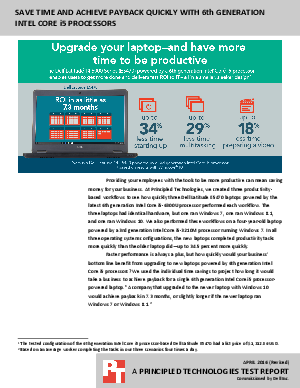 Dell partnered with Principled Technologies to create three productivity-based workflows to see how quickly the new Dell Latitude E5470 laptop powered by the latest 6th generation Intel® Core™ i5-6300U processor performed compared to previous generations. How do these substantial performance improvements pay for themselves and make your employees happier? Read on.